If you enjoy the music of the most popular folk/rock group of all time, then you’re going to love CSN Songs, the only Crosby Stills Nash and Young tribute show of its kind! CSN Songs will perform at the Arts Center of Coastal Carolina Friday, August 31, Saturday, September 1, and Sunday September 2, bringing you the music of a band known for intricate and soaring harmonies, memorable guitar lines, and lyrics that spoke for a generation. When David Crosby, Stephen Stills and Graham Nash first hit the stage at the famous Woodstock Music Festival in the summer of 1969, the face of folk/rock music would be changed forever. Their legacy continued for decades, and today, the harmonious vocals for which Crosby Stills Nash & Young are so well-known can be heard in every song performed by this incredible tribute band. 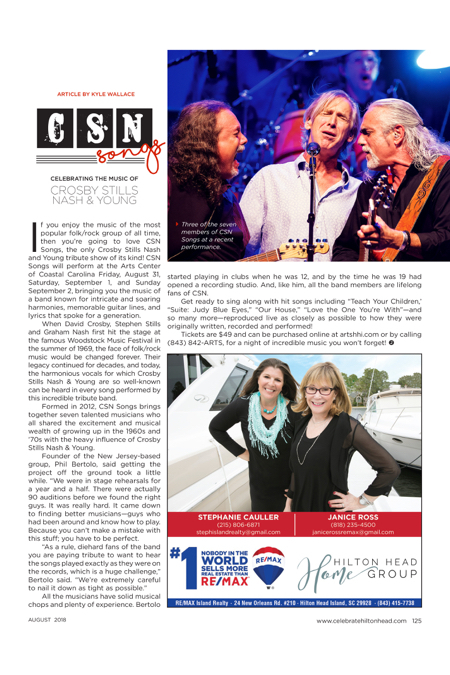 Formed in 2012, CSN Songs brings together seven talented musicians who all shared the excitement and musical wealth of growing up in the 1960s and ’70s with the heavy influence of Crosby Stills Nash & Young. Founder of the New Jersey-based group, Phil Bertolo, said getting the project off the ground took a little while. “We were in stage rehearsals for a year and a half. There were actually 90 auditions before we found the right guys. It was really hard. It came down to finding better musicians—guys who had been around and know how to play. Because you can’t make a mistake with this stuff; you have to be perfect. All the musicians have solid musical chops and plenty of experience. Bertolo started playing in clubs when he was 12, and by the time he was 19 had opened a recording studio. And, like him, all the band members are lifelong fans of CSN. Get ready to sing along with hit songs including “Teach Your Children,’ “Suite: Judy Blue Eyes,” “Our House,” “Love the One You’re With”—and so many more—reproduced live as closely as possible to how they were originally written, recorded and performed! Tickets are $49 and can be purchased online at artshhi.com or by calling (843) 842-ARTS, for a night of incredible music you won’t forget!